Hops aren't just used for brewing beer. Landscapers are incorporating the quickly vining perennial hops into their gardens for its beauty. Estimates vary as to how many microbreweries dot the Greater St. Louis region. Some go as high as 50, with more springing up all the time. That doesn’t count the number of home brewers, who painstakingly create masterful beer in their basements using endless variations of the standard grain, yeast, water and hops. Hops are used to preserve, flavor and add aroma to beer. They are front and center when beer lovers begin talking about the flavor nuances of one beer versus another. Plus, they are the one ingredient beermakers can attempt to produce in their own gardens. Whether or not they actually use them to brew, gardeners, as a whole, are discovering that quickly vining, perennial hops plants can add beauty as well as a bit of utility to their landscapes. 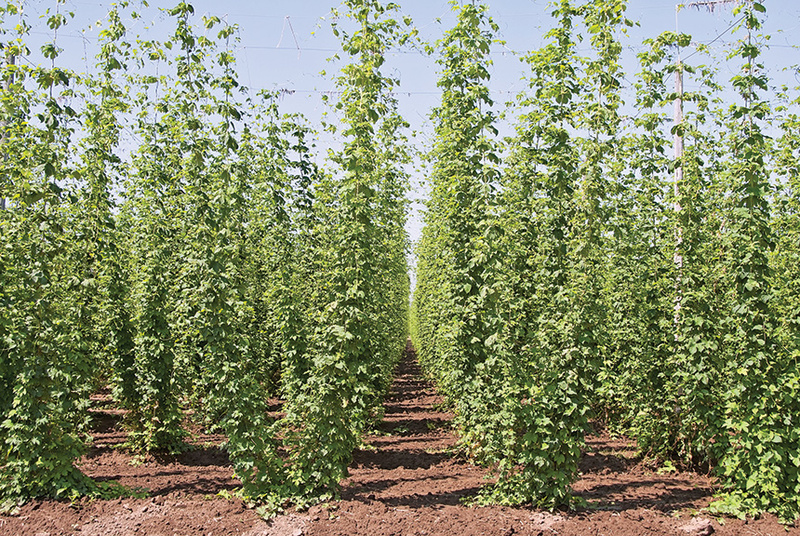 While common hops are attractive, hybridizers are working to make them even more so. Humulus lupulus "Aurea" has most of the same characteristics as common hops but the leaves emerge brighter chartreuse in spring and tend to keep more of their yellow coloration during the growing season. Last summer Aurea was part of the display in the Botanical Garden Herb Garden. "Cascade" hops, developed at the University of Oregon and named for the state’s mountain range, is considered an essential hop in many American pale ales. This year Cascade will be available locally at Sugar Creek Gardens and by mail order through Stark Brothers. A vigorous vine, Cascade can grow up to 25 feet in height. Sugar Creek also will carry "Bianca," a hop vine grown only for its ornamental beauty. With chartreuse foliage eventually turning lime green, Bianca features clusters of yellow, cone-like flowers from mid-summer through mid-fall. Brick red stems enhance the vines. Like other hop varities, Bianca is a vigorous grower and can quickly cover garden structures. Gardeners with smaller spaces might prefer strictly ornamental "Summer Shandy," marketed under the Proven Winners label. It grows from 5 to 10 feet and maintains golden yellow foliage throughout the season. Hops vines also can be started from root rhizomes planted directly in the soil. Local craft breweries understand that trying to produce vast quantities of hops in the St. Louis area can be a dicey proposition. Typically, hops are grown in cooler climates. But that doesn’t mean they’re not trying. Derrick Langeneckert of Alpha Brewing on Washington Avenue reports they have been growing hops in the Wayside Community Garden in Normandy for three years with varying success. In two of those three years they have actually harvested enough of a crop to use in their commercial brewing process. Christopher Corelli of Webster Groves is a home brewer who tried growing his own hops for the first time last year. He planted both Cascade and Chinook (also available through mail order from Stark Brothers) varieties. While the Cascade hops did not do well, the Chinook, which his research uncovered as being one of the most heat tolerant hops, thrived and he harvested a crop which he used in his fall brewing. Typically, Chris notes, home brewers only use home-grown hops at the end of the process for aroma, as the bitterness of a particular crop would need to be established by a lab for it to be used in the full brewing procedure.